Dr. Cohn’s mental game coaching and CD programs have been instrumental in helping athletes in all sports to improve performance through mental game strategies to raise confidence, improve their mental game, erase self-doubt, maintain focus, and retain composure. Here are just a few case studies of athletes who have benefited from Dr. Cohn’s programs. Check out these Peaksports students’ success stories, or you can browse the Peak Performance Sports’ testimonials from coaches and athletes. If you don’t see your sport listed here, don’t worry; we work with athletes of all ages—from junior to senior—in all sports. Nicolas was a perfectionist with super high expectations about his basketball game. After only one month of mental coaching with Dr. Cohn’s sports psychology program, he was able to improve his focus and composure for basketball. He had trouble dealing with mistakes and missed shots–and would get upset quickly with himself. When frustrated, this mindset would lead doubt and making more mistakes because he was dwelling on the past and rushing his performance. Diane Wade sought out of the help of Dr. Cohn after she had lost her focus on the horse and had fallen, which consequently led to injuries and self-doubt. Dr. Cohn worked with Diane to help her relax on the horse and improve her mental preparation before showing. Now, Diane shares her success story of how she used the strategies she learned from Dr. Cohn’s coaching program to win an adult class on a new horse using some of the strategies she had learned from Dr. Cohn’s coaching program. You can discover the details about how she prepared mentally before showing. Matt Boni, National MX Champion, worked with sports psychology expert Dr. Cohn from the time he was an amateur motocross champion at age 15 all the way until he turned pro as a motocross racer. Matt talks about his experience working with Dr. Cohn and the importance of the mental game of motocross racing. Julia Dreyer’s two daughters competed in American quarter horse equestrian class at the national and world level. 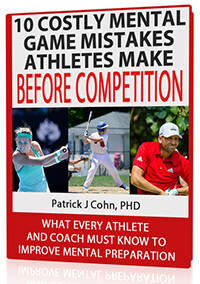 Julia sought out Dr. Cohn to help her kids raise their confidence and cope with the pressures of high-level competition. Instead of being overly focused on other competitors, they learned how to focus on being mentally prepared before going into the ring. Pro Surfer Shawn Burrell, used “The Confident Athlete Series” programs to help him improve confidence, focus, and trust in surfing. In the past, he would judge himself, try too hard, and have doubt during competition. After completing the CD series, he learned how to take control of his confidence and focus on doing his best during competition. Shortstop Tylor Prudhomm worried too much about striking out at the plate. This caused him to try to be perfect in the batter’s box. Nevertheless, he still lost the pop on his swing and his swing was indecisive. After completing “The Confident Athlete” CD programs, he gained confidence and was able to focus on the things he can control in his sport. Even his coaches could see greater confidence in his play! Shooter Mario Kapodistrias needed to qualify for his national team, but he had low self-confidence in his trap shooting. He worried about missing targets, and unfortunately, his scores showed it. After finishing “The Confident and Focused Athlete” programs, he no longer had any doubts and was able to focus on his game. When he missed a target, he did not panic but remained focused in the present! Adam’s son Josh is a 10-year-old wrestler. Josh’s performance was hindered by trying to be too perfect in his wrestling matches. This caused him to over-think his moves, hesitate, and worry about making mistakes. Adam and Josh completed “The Fearless Athlete” and worked directly with Dr. Cohn on the principles in the program to help Josh improve the mental game of his wrestling. In just 3-4 weeks, Josh’s coaches saw an improvement in his performance. Coach and amateur basketball player Paul Rask struggled with his confidence in shooting, and deemed himself “The Reluctant Shooter.” He was afraid of missing and would second-guess his shooting ability. After completing “The Composed Athlete,” he learned how to be more confident in his game and not worry about missing. Even after missing a first shot, he stayed confident and kept shooting. Mark’s 17-year-old son struggled with tension, anxiety, and nervousness at the plate last year. “He was pressing too hard and losing all his mechanics,” said his father, who admitted to contributing to his son’s problems. Mark’s son completed “The Fearless Athlete” and “The Relaxed Athlete” programs. Mark learned how to stop over-coaching as a parent, and his son learned that it’s OK to be anxious and began to be able to relax at the plate. Coach Tony Acosta, who coaches 10-11 year olds in Australian rules football, talks to sports psychology expert Dr. Patrick Cohn about how he used “Kids’ Sports Psychology” resources to beat a formidable opponent and win a championship with his team.